The call credit spread is a neutral to bearish strategy where you want to see the price of the underlying stay where it is or drift lower. I made a mistake when I opened this position up and accidentally opened up the spread with an expiration in May. My thesis was the same no matter time line and the probabilities didn't really change anything; however, that's much too long for this to play out. Luckily, the markets obliged last week by moving lower which allowed me to close out the position for a profit. My net profit on this spread worked out to $12.97. That might not seem like much, but you have to remember that it was earned on just $200 of capital (the $2.00 width of the spread). That works out to a 6% return on capital. Not bad for just a couple weeks. I was able to capture 22% of the maximum credit in 20% of the days to expiration. So time worked for me by just doing what it does and constantly moving forward. When it comes to the short side of options time is your friend because option contracts lose value as time goes on. Nope that's not a typo, I actually had 2 different spreads on although this one was much more favorable since the expiration was in April. My net profit on this spread worked out to $15.77. Once again that was earned on just $200 of capital in play so the return was a solid 8%. With my spread trades that I put on my target is to capture 50% of the total credit received and I was pretty close to that target by capturing 46% of the credit. One thing I've learned regarding spreads is that it's absolutely critical to keep your costs in check. 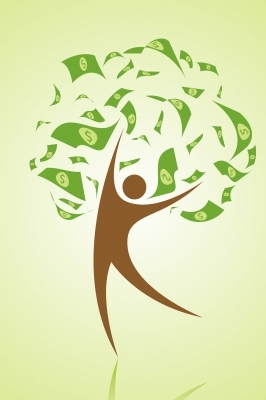 Commissions will eat up a huge chunk of your potential profits. With this spread alone I paid over $11 in commissions/fees which is almost as much profit as I was able to lock in. That's brutal. Sometime over the coming months I'll be opening up another account where the commissions are drastically lower. With one of the brokerages I'm considering this spread would have produced a profit of $24.91 using their commission schedule and generated a 12% return on the $200 of capital if I opened and closed at the same prices. Or in other words I could have increased my profits by about 60% just by using a different broker. Yikes! I found myself in a situation where I was extremely bullish on Nike. I'm not saying that's a bad thing because I think the company is top notch and the valuation is reasonable, but I somehow found my way into being way to exposed to just one company. Nike reported earnings last week and despite revenue in line and a big beat on earnings, the share price fell nearly 7% the day after earnings. Lucky for me though Nike's price rebounded back up the next day which allowed me to take off this position even though it was just 1 day from expiration. I was able to generate a total profit of $50.91 by selling, and then buying back, this put option. On the $5,400 of capital "at risk" that's a decent 0.94% return or 23.9% annualized. I was able to capture 91% of the maximum premium in 94% of the days until expiration thanks primarily to the contraction of the implied volatility. While the call credit spread is a neutral to bearish strategy, the put credit spread is the opposite; it's a neutral to bullish strategy. 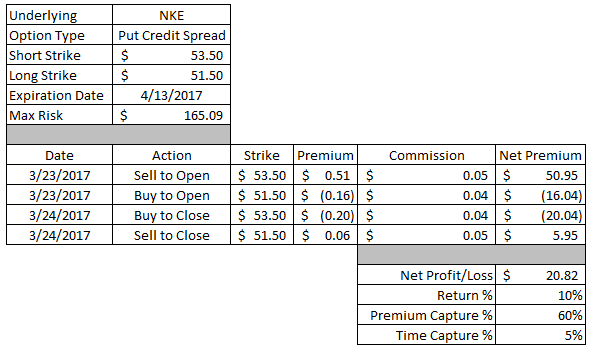 After Nike's post earnings selloff that felt overdone I opened up this put credit spread to try and capitalize on a short term bounce back higher while reducing the capital requirements compared to just selling another put option. 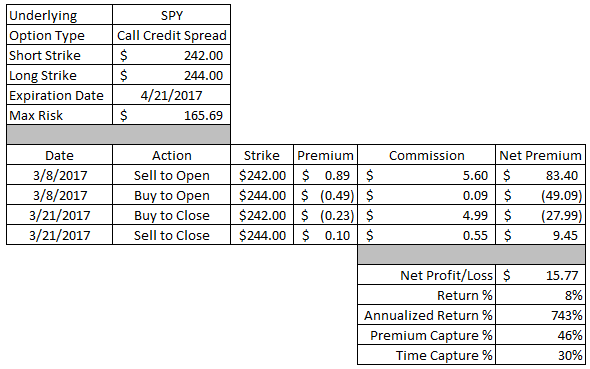 The markets cooperated wonderfully here and I was able to close out the spread the day after opening it while generating a solid profit. This put credit spread produced a net profit of $20.82. Based on the $200 of capital in play for the width of the spread that's a solid 10% return in just 1 day. I was able to capture 60% of the credit received in just 5% of the days until expiration. Thank you implied volatility contraction and share price rebounds! Like I mentioned earlier I somehow set myself to be way too bullish on Nike and depending on things went this week I could have potentially found myself as the owner of 300 shares of the company. That's not really a bad thing, but in the span of a week I would have made Nike by far my largest investment in terms of capital deployed. I was able to generate a total profit of $63.91 from this call option which was a solid 1.07% return based on the $60 strike of the contract. Since this was originally opened via a buy-write my per share cost basis of those 100 shares gets reduced from the original $58.42 to $57.77 ($58.42 - $63.91/100). 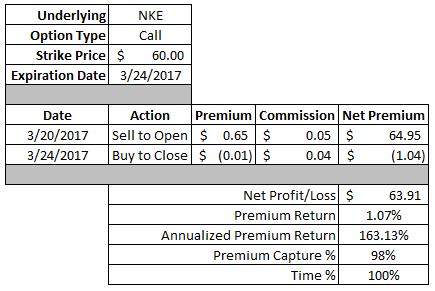 Opening another covered call on the shares of Nike I had purchased on Monday of last week. If Nike's share price remains below $58 then I'll just get to keep the premium as profit. 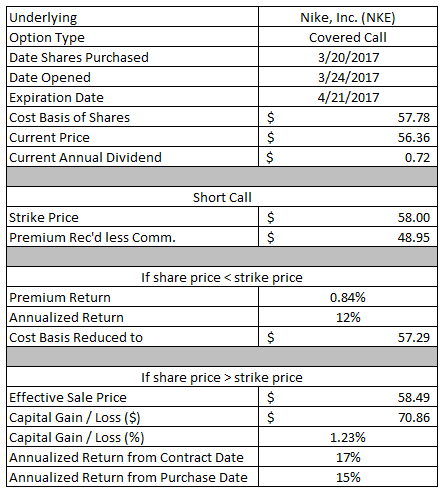 The $48.95 option premium would be a 0.84% return based on the $58 strike ($5,800) of the call option or a solid 12% annualized return. This would allow me to reduce my cost basis by another $48.95 to $57.29 per share. If Nike's share price rises above the $58 strike of the call option then I'll have to sell my 100 shares at an effective sale price of $58 + $48.95 /100 or $58.49. This would result in a 1.23% gain on my cost basis with an annualized return of 15% from the time the shares were purchased. Using the delta of the call option as a probability gauge there's roughly a 30% chance the contract ends up in the money. Or in other a 70% chance that I'll get to just keep the premium, reduce my cost basis and sell another call option. Time will tell how this will play out, but I don't expect to do any management on the position, i.e. closing it out early, except for possibly rolling it forward as we near expiration. Okay, this will be the last mention of Nike in this post. 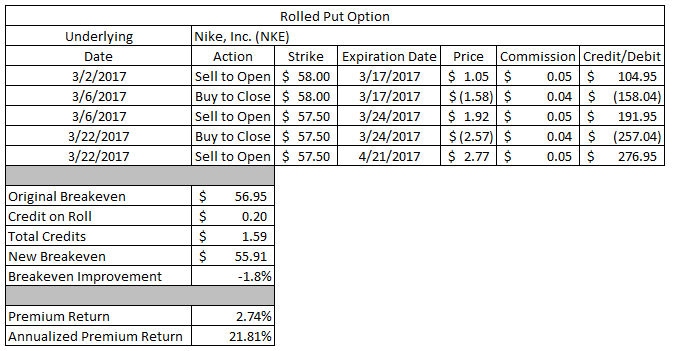 I originally opened a put option in Nike in early March, but then rolled it forward into the earnings cycle. Luckily with the higher implied volatility due to earnings I was able to lower my strike from $58 to $57.50 and still take in a credit. Well, after the post earnings sell off in Nike I ended up rolling the put option out in time yet again. I was able to collect a $0.20 credit for rolling out in time which lowers my breakeven point. My original breakeven was $56.95, but between the original premium received, the credits on the 2 rolls as well as the lowering of the strike price I was able to reduce my breakeven, or effective purchase price, to $55.91. That's a 1.8% reduction. If Nike's share price remains below the $57.50 strike price then I'll have to purchase 100 more shares of Nike at an effective purchase price of $55.91. 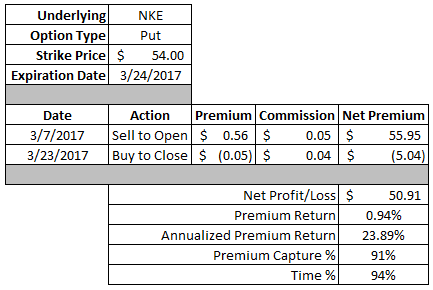 If Nike's share price rebounds back above the $57.50 strike by expiration then I'll get to keep the full option premium as profit. The $158.77 in option premium would be a 2.74% return on the original $5,800 of capital to secure the first contract. The annualized return, from the date the position was first opened until the expiration of the newly rolled contract, would still be a solid 21.8%. In hindsight I overreacted to the post earnings decline. I should have executed more patience to see how thing went with a couple days left until expiration. Had I waited until the afternoon on Friday to make a decision I could have closed out the contract for a small profit or rolled it out in time for potentially a better credit or lowered my strike price yet again. Patience is a virtue. This weeks bonehead move came from my bet on volatility increasing. Well, I guess the bonehead move came back in January when the position was opened. At the time it seemed like volatility had no place to go, but up. Of course it could also contract and contract it did. This was by far the worst option move I've made and it resulted in a $313.73 loss. Ouch! I lost 98.3% of the money I invested in this call option. Ugh! Note to self: DON'T BY CALLS ON THE VIX!!! I still think the volatility in the market is bound to mean revert, but the problem is that you have to be absolutely right with the timing or you will get crushed. I'll possibly explore some other ways to play rising volatility, but buying long calls will not be it. During the markets first 1% decline in the last 100+ days last week the financials really took it on the chin. Bank of America dropped nearly 6% so I took a bit of a contrarian play that it would be a short lived dip. With interest rates rising the banks are set up to improve their profitability and Bank of America's dividend payout can easily be increased almost 3x to bring their payout ratio in line with the other big banks. If Bank of America's share price falls below $22.50 then I'll have to purchase 100 shares at an effective purchase price of $22.01. The valuation looks solid there at 14.7x 2016's earnings and 12.6x 2017's estimates. That purchase would also be for an additional 4.4% discount to the current price on top of the ~6% discount from the high from earlier in the week. If Bank of America's share price remains above $22.50 then I'll get to keep the full option premium as profit. The $48.95 would be a 2.18% return on the $2,250 of capital in play with an annualized return of 28.9%. Since Bank of America has earnings coming out the week this contract expires I don't expect to do any management with this contract until expiration. 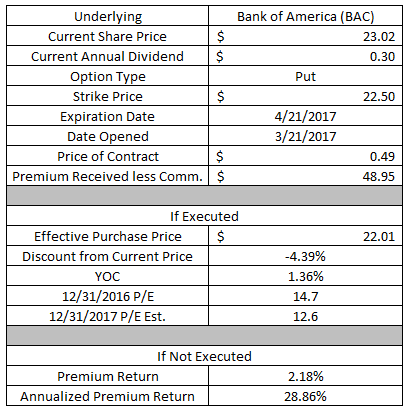 Unless Bank of America's share price climbs much higher, and thus farther away from the strike price reducing the price of the option. Kroger's share price has tanked pretty hard over the last month declining from around $34 to the current price near $29. That's a 15% decline in just one month while the market are generally up. The grocery business isn't one that I really want to be in long term because the margins are astoundingly low which puts the grocers at risk of margin squeezes from a very low starting point. So this is very much more of a contrarian play that Kroger's share price will drift back higher after such a large move down. If Kroger's share price remains below $29 then I'll have to purchase 100 shares at a price of $28.25. The valuation is pretty solid there at 13.3x trailing earnings and 12.9x the current fiscal year estimates. That looks pretty good considering the 5 year average P/E is closer to 17x. My purchase price would be at a 2.4% discount from the price when the contract was opened. 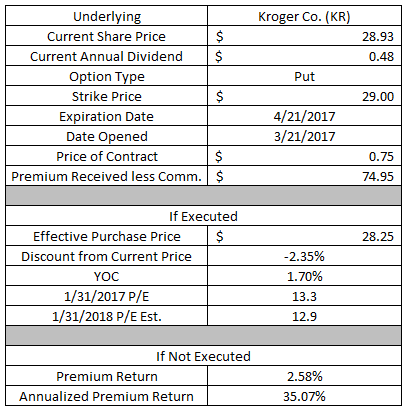 If Kroger's share price climbs back above $29 by expiration then I'll get to keep the full option premium as profit. The $74.95 premium would be a 2.58% return on the $2,900 of capital securing the contract. If held through expiration the annualized return would come to 35.1%. Ideally Kroger's share price would move back higher to the low $30's. A move higher would do two things to help me out (1) move away from my strike (2) lead to a drop in implied volatility, that would both lower the price of the contract and allow me to close the position early for a profit. As I mentioned earlier I'm not a big fan of the grocery business; however, Whole Foods is a bit insulated since they act as more of a niche grocer selling only organic foods. Although their business has taken a hit recently as all the other grocers recognize the shift to organic/natural foods by expanding their own selections which means Whole Foods is no longer the only game in town. 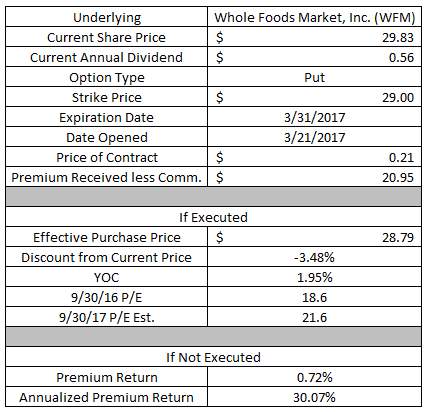 If Whole Foods' share price falls below $29 by expiration then I'll have to purchase 100 shares at an effective purchase price of $28.79. The valuation is a bit worrisome at 18.6x the trailing fiscal years earnings, but 21.6x the current years estimates. Yikes! Declining earning are no bueno. Luckily the premium would allow me to purchase shares at a 3.5% discount from the price at the time the contract was opened. If Whole Foods' share price remains above the $29 strike then I'll get to keep the full option premium as profit. The $20.95 option premium would be a 0.72% return on the $2,900 of capital "at risk" or a 30.1% annualized return through expiration. Since I only brought in about $21 of option premium and expiration coming this Friday I don't plan to do any management with this position. This contract sets up pretty nicely so that if the shares are put to me I'll be able to collect the next dividend payment of $0.14 (ex-div date 4/5) and also be able to write at least 1 and potentially 2 call contracts on these shares. The only way I would roll this contract out in time is if the contract is in the money and I can collect a credit on the roll that is higher than the $0.14 dividend payment. Colgate-Palmolive is a company I've wanted to own for quite some time, yet the valuation has just never been appealing to me. At least not whenever I had capital ready to deploy. Similar to the Whole Foods put option this is just one of those situations where things set up pretty solidly to potentially generate some solid returns. If Colgate's share price is below the $71 strike price at expiration then I'll have to purchase 100 share at $70.37. That would be at a 4.6% discount to the current share price. The valuation doesn't look all that great at 25.0x last years earnings and 24.0x the estimates for the current year. If Colgate's share price is above $71 at expiration then I'll get to keep the $62.95 as profit. That would be a 0.89% return on $7,100 of capital securing the contract or 15.8% annualized through expiration. The reason I like this position is that there's lots of potential to generate even more option premium and even collect a dividend. 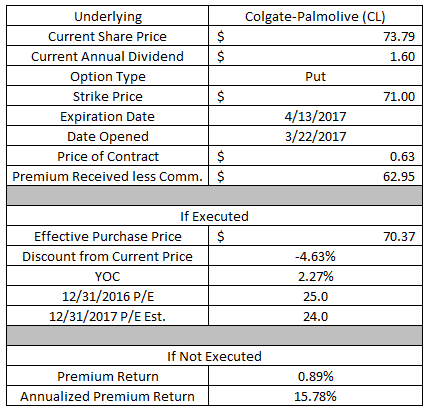 Colgate's next ex-div date is April 19th so there's an additional $0.40 per share of cost basis reduction. Colgate also is scheduled to release earnings on April 29th so I would be able to sell a covered call on these shares with juiced up implied volatility which means juiced up option premium. Thus far March hasn't seen anywhere near the success as the previous 2 months for generating option income. Although that's largely tied to my boneheaded VIX long call. So far in March I've locked in $500.62 in net profits from option income and YTD the total is still a hefty $3,657.74. Looking forward to this week I have 7 different positions that expire on Friday. Five of those positions will likely just be left to run through expiration, but there are 2 that will need attention. Those 2 are my Union Pacific $104 put option and my Gold Miners ETF $23.50 put. Regarding the Union Pacific put I'll likely wait until late in the week to make a decision. The current share price is essentially at my strike price. Ideally it would expire out of the money, but I might roll it out until the April 13th expiration if I can collect a credit or the April 21st expiration that has earnings if I can collect a credit and move down my strike. The Gold Miners ETF put is a bit of a different beast. Many of the gold related investments have skew towards higher call prices compared to the puts; most stocks and index funds are the opposite. So it might make more sense to take the shares if the contract expires in the money and then write call options as opposed to rolling out in time. It's really a question of do I want to lock up capital or just keep kicking the can down the road and collecting credits. Of course I need to look at the bigger picture by looking at the likelihood of my other GDX/GDXJ contracts ending in the money since those will tie up capital as well. I want to say something about the long call on the VIX. the loss is not about trading the vix. Its about trading long options. With long options you always have to be right to make money. it doesnt matter what underlying you are trading. Personally i just dont want to play with long positions. but this is my opinion. I'm glad you enjoy the articles. 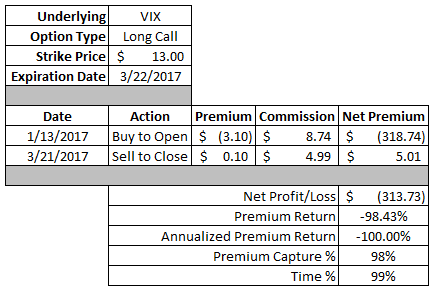 Regarding the VIX trade I completely meant to frame it as don't buy long calls, not necessarily don't buy long calls on the VIX. Although long calls on the VIX are also harder because of the positive call skew especially when the VIX is this low. That makes the calls even more expensive than what they should be and not to mention the fact that the timing has to be excellent because of the large mean reversion in VIX. Completely agree with you on using long positions though. It just doesn't make sense unless you're extremely tight on cash or have an absolutely firm conviction. I'll stick to selling my options though. Thanks for sharing these trades. These descriptions have much more value to me as a small independent trader than the typical newsletter salesman posting options info on the web. I tend to not close trades to lock in a portion of the premium earned but may have to look at that more closely based on your examples. I'm glad you enjoy my option trades explanations. I know a lot of people think options are inherently risky, but I think that relates more to the fact that many just have that assumption, but haven't educated themselves on options. Because of that I try to give as much detail as I can about the various moves that I make since I think it makes things a lot clearer both for myself and for others. Regarding closing positions out early, to me, it really comes down to the efficiency of your capital. If you can only make say $0.20 on a put option you sold, but have to wait another 2-3 weeks until expiration you're risk/reward profile is now skewed more towards risk. Your additional gain is only $0.20 more of the credit while the risk is much larger because the share price could move way below your strike. That's not necessarily a bad thing if you're fine owning the company at that level, but for me I want to use options to enter positions as well as generate income via the premium which means it's all about the efficient use of capital.